Playing inside forehands is basic at the world class level. Roger Federer, Pete Sampras, Steffi Graf. Some of the greatest champions in tennis history. You might think their games are completely different, and in many ways you'd be right. But they have one thing in common underlying their success: Mastery of the Inside Out position. Craig Cignarelli is one of the most prolific and successful developmental coaches in the country. His original analysis of professional tactics and movement is unique in modern coaching. Based at the renowned Riviera Country Club in Southern California, Craig has personally nurtured 4 junior players from the beginning of their careers who have gone on to achieve #1 national rankings. 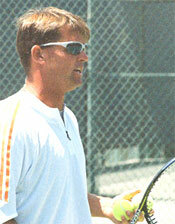 Currently he is working with a cadre of aspiring WTA and ATP players, as well as competitive juniors at all levels. Versed in 4 languages, Craig is completing his first book "What Champions Know," which forms the basis for his articles on Tennisplayer.